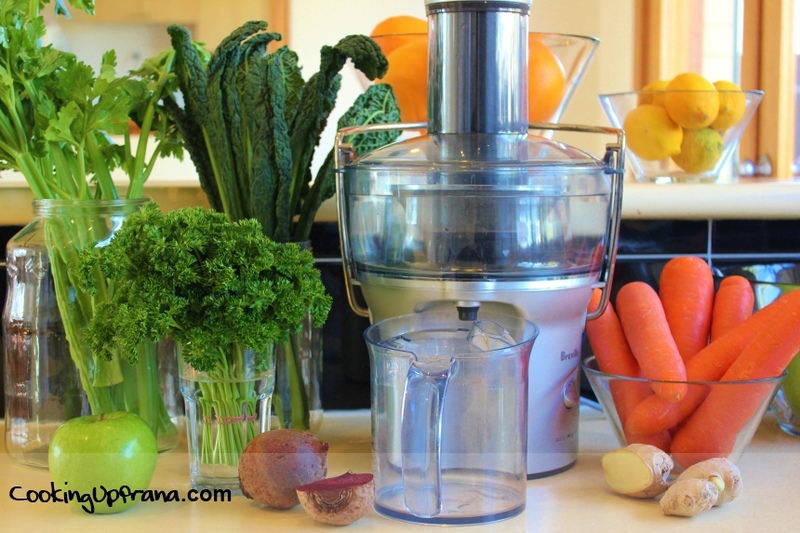 Of all the kitchen appliances I love, and I’m passionate about quite a few, a juicer is one that I’ve always lusted after though never had a chance to try out. Until now. 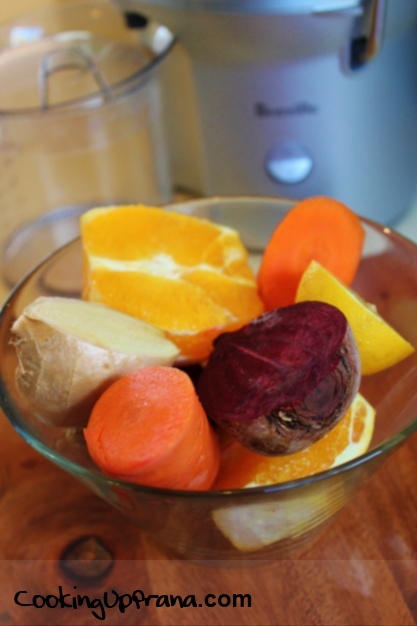 In this post I’m sharing “The Healthiest Drink on Earth” one of the juice recipes I created that leaves me feeling energized and refreshed after I drink it. Lately we’ve been hearing a lot of buzz about juicing. The benefits of green drinks have been sung from the webpages of many health gurus and blender companies alike. Proponents say that juicing provides the body a quick injection of nutrients while giving the digestive system a rest from breaking down fiber. 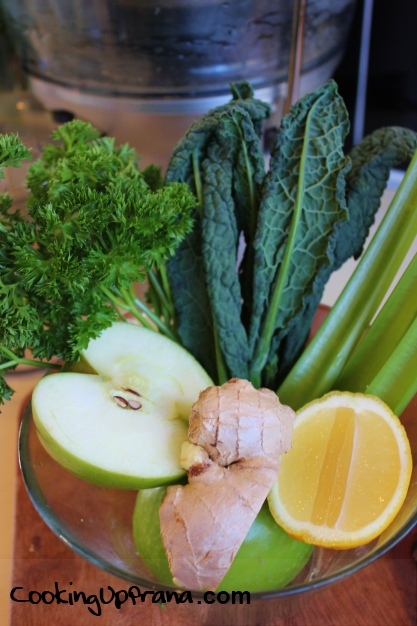 I was just going to share “Green Juice, The Healthiest Drink on Earth” but I had so much fun juicing and snapping shots of this gorgeous, colorful juice that I decided to include two drinks. 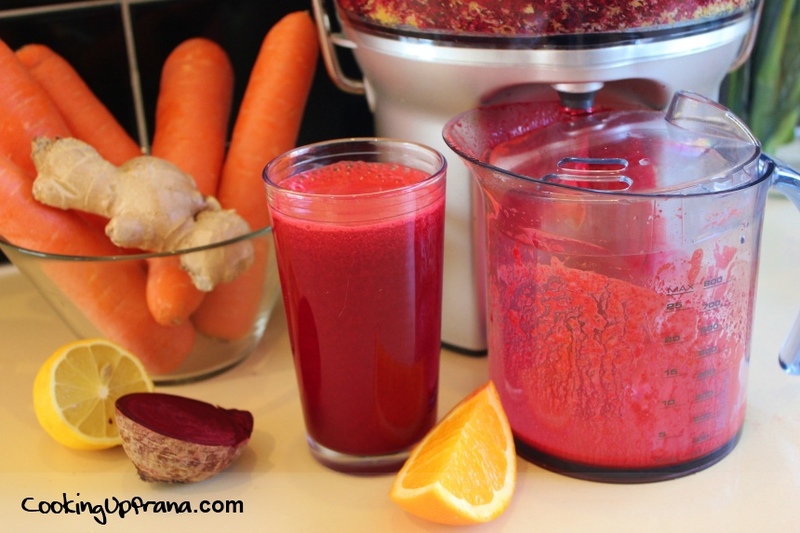 The first is called “Prana Juice” as it is literally teeming with life force boosting fruits and veggies including: ginger, carrot, beets, oranges, and lemon (from the neighbor’s tree). This “super drink” is literally made from the best stuff on Earth (unlike Snapple which uses questionable ingredients such as high fructose corn syrup) making it full of goodness (think antioxidants such as vitamins A, C, and K that will cycle through your body cleaning up any toxins in sight). 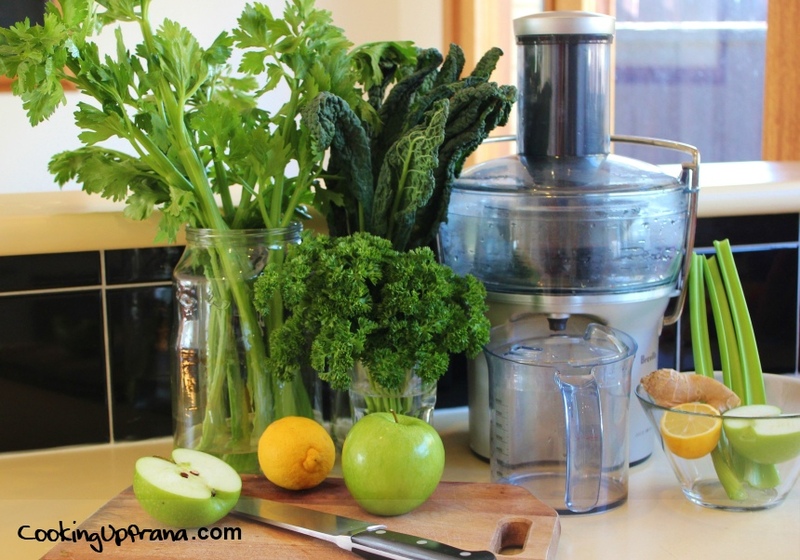 Green Juice also has heaps of calcium, beta carotene, potassium, magnesium, and folate. By adding ginger you give yourself an extra dose of anti-inflammatory action which helps to reduce arthritic pain. 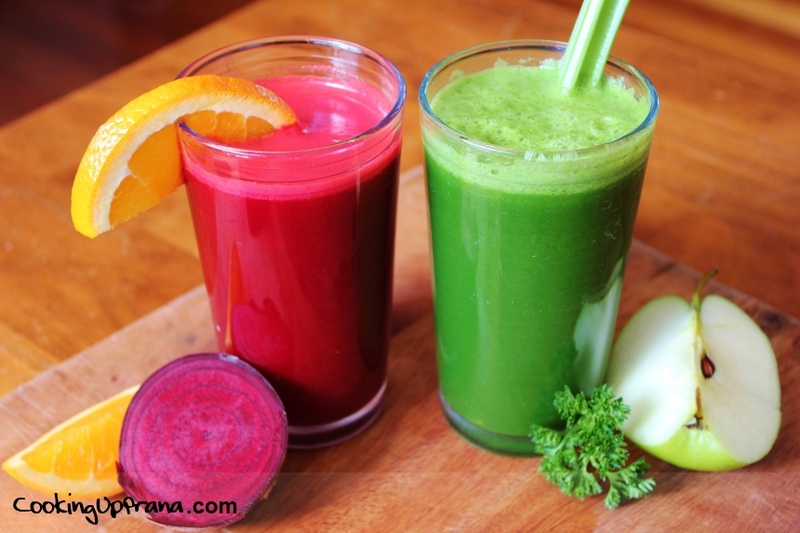 1) Two fabulous drinks full of healthy, life-drenched prana. 2) We go through fruits and veggies like whoa. 3) I crave fresh juices over less healthy options. 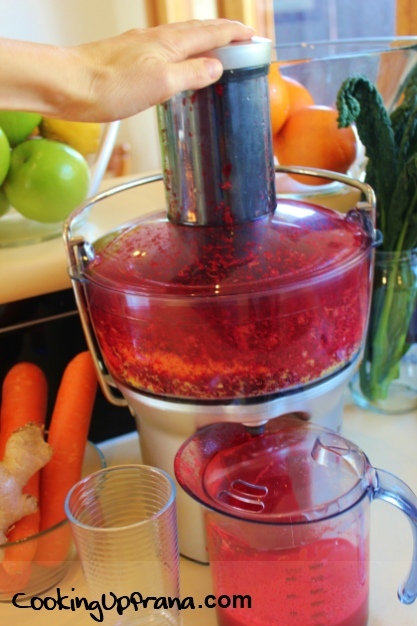 Add ingredients to juicer and press start to begin juicing fun. Remember, juicing is not an exact science so feel free to play around with the proportions. 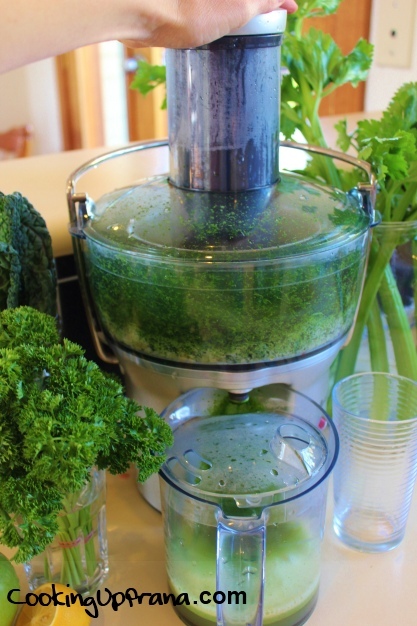 Just make sure to wash and scrub your veggies well before juicing! NEXT POST: Why One-on-One Yoga?